This DIY Walker Bag Keeps Your Items Handy! 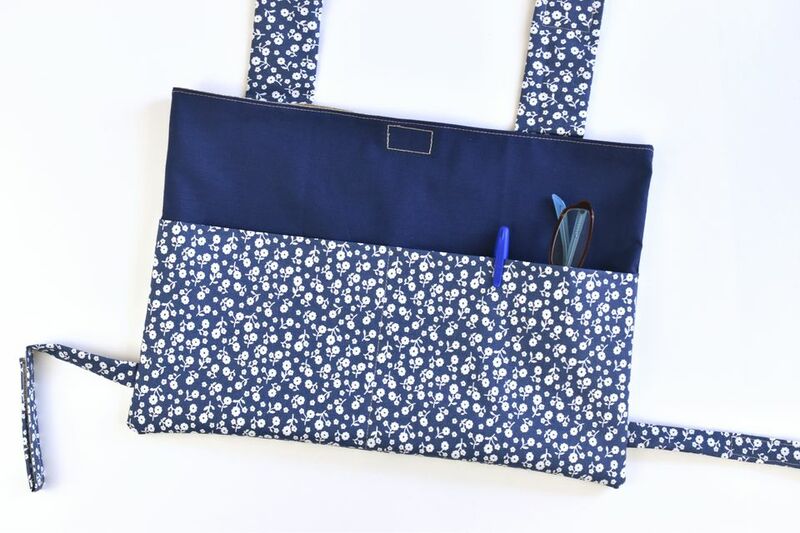 This free walker bag pattern securely and safely carries everything you need. The pockets in the bag allow you to keep things organized and easy to find. You can sew a walker bag for yourself, or make one as a gift for anyone who uses a walker. It's also a great project to sew and donate to hospitals and nursing homes. The size of this bag fits most walkers, but it's easy to adjust the dimensions to suit your needs. You can also customize it by embroidering a name or adding other decorative elements. Using a .25-inch seam allowance, sew all four straps into long tubes, backstitching at the beginning and end. Press each seam allowance open with the seam centered on the flattened tube. Sew across one end to close it. Turn the tubes right side out. A turning tool is helpful on the thin tubes. Flatten the tubes with the seam allowance centered again. Cut two 1.5-inch pieces of each side of the wider hook and loop tape. Sew one side to the closed end of the large straps. Sew the other side 6 to 7 inches from the closed end. Cut two 1-inch pieces of the narrower hook side tape. Cut two 4-inch pieces of the narrow loop side tape. Sew the smaller pieces to the closed end of the small straps. Sew the large pieces 4 inches from the closed end. If you'd rather skip the hook and loop tape, add buttons and buttonholes instead. Note: The measurements on these straps work on a simple straight walker. For a collapsing or large walker, you may need to adjust the size or placement of the hook and loop tape. Fold a pocket piece in half with wrong sides together. Place it on one of the body pieces, with the raw edges aligned with the edges of the body piece. Measure and mark to the center of the pocket piece. Sew a vertical line on the pocket, back stitching at the beginning and end. This divides the pocket into two smaller pockets, but you can add more lines of stitching or change the placement to customize the pockets. Repeat with the second body and pocket pieces. Place the larger straps at the top of one of the body and pocket pieces. Line up the raw edges of the straps with the edge of the body fabric, with each strap 2.5 inches from the sides. Place a lining piece over the top, with right sides together. Pin the layers along the top edge, making sure the straps are pinned in place. Sew the seam with a .25-inch seam allowanceBackstitchch over the straps for added strength. Sew the second lining piece to the top of the second body/pocket piece. Place the side without the straps face up on your work surface. Position the thinner straps on the sides, 1.5 inches from the bottom of the pocket. Pin the second side of the bag to the first with right sides together. Be sure to secure the side straps with pins and align the center seam. Starting on the lining side, sew around the four sides of the bag. Leave a 4-inch opening in the lining and back stitch at the beginning and Backstitchtitch over the side straps and at the folded top of the pockets. Turn the bag right side out through the lining opening and then sew the opening closed. Push the lining into the bag and press open the seams at the top of the bag. Topstitch around the top about 1/8 inch from the seam. Cut a 2-inch piece of hook and loop tape and sew one piece to each side of the center top of the bag. Use the straps to attach the bag to a walker and get ready to go and carry all you need!